Indian Hills Animal Clinic is pleased to offer first class accommodations to all our furry guests. Here your pet’s health and comfort are our top priorities. Animals are always anxious to some degree when they are away from home and their normal routine is altered. Our goal is to minimize that stress with attention, kindness, exercise, and the occasional treat. All our guests will be cared for by compassionate and trained staff. Our veterinarians are also on hand and on call for all our “campers” medical needs. We appreciate the trust our clients place on us to care for their special companions. It’s a large responsibility and one we take very seriously. We are proud to announce that we are also an accredited member of the International Boarding & Pet Services Association. This accreditation means that we hold ourselves to a high level of standards for care of our campers and cleanliness of our kennels. Only four boarding facilities (veterinary or non-veterinary) in the state of Kansas are accredited through this program. For more information on what it means to be an accredited facility, visit the website at: www.ibpsa.com. 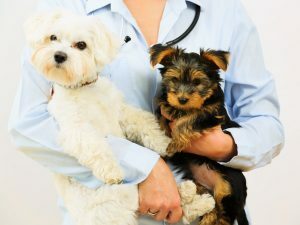 Indian Hills Animal Clinic requires that all pets staying at our camp are fully protected from potential infectious disease by being current on all vaccinations prior to boarding. To ensure a safe & healthy environment for all of our guests, owners will need to provide the following proof of vaccines. Dog’s vaccines are current against rabies, distemper, and bordetella and cat’s vaccines are current against rabies and distemper. To give full protection, it is highly recommended these vaccines need to be given 2 weeks prior to boarding at our camp. We have multiple sized kennels for our canine guests to stay in, including large runs for your pets comfort. Comfortable bedding is placed in all kennels and dogs staying in our runs enjoy sleeping on elevated Kuranda beds. Our guests are taken outside three times daily to a fenced in area for plenty of fresh air and exercise. We recommend bringing your pets own food, but do offer sensitive stomach veterinary diets served with plenty of fresh, cool water. Our feline campers enjoy condominiums that are roomy and comfortable with cozy resting benches. Each condo can be configured to either two stories tall or two rooms connected via a porhole for expanded room. Each guest can be let out individually to play, explore the cat ward, or just relax on our cat shelves. Our veterinarians are always on call for your pet’s medical needs. Our facility is equipped with a security alarm and fire sprinkler system for your pet’s safety. Our knowledgeable staff is trained to recognize early warning signs of any health problems. We record eating and elimination habits of your pet throughout the day to ensure their health and comfort. Indian Hills Animal Clinic finds our boarding facility comparable to a hotel. We reserve your pet’s kennel or run based on check-in and check-out times. Check-in time is 1:00pm and check-out time is 12:00pm. If your pet is picked up after that time, you will be charged for an additional day. This hotel reservation allows us to ensure your pet’s room is available the entire time they are our guests. Guests that check in or check-out on Saturday’s do so during our regular business hours of 8:00am and 12:00pm. For more information on costs for your dog or cat to stay in our facility, please contact either clinic location. Our 13th street clinic offers boarding to exotic pets such as birds, rabbits and ferrets. We ask that owners provide their pet’s home and food since every exotic has different needs. Please contact us for details on boarding your exotic pet at 942-3900. Indian Hills Animal Clinic offers additional services to keep your pet happy & comfortable while you are away. Your pets can have additional walks, one-on-one playtimes with our animal care assistants, or even group daycare at our Maize road location. If your pet requires medications while boarding, our nursing team will ensure they receive the proper medications and attention to their health care needs. For a copy of our boarding policies, please download our annual camp agreement here.